Capcom newsletter showcases cryptic image. The Resident Evil 7 demo remains exclusive to PS4 for now, however that’s not stopped eager PC players from speculating on what it might all mean from afar. We now know the console teaser James went hands-on with at E3 won’t feature in the final game—the latter of which is coming to PC on January 24—and, if you signed up to become a Resident Evil Ambassador (to receive Capcom’s newsletter), you’ll now also know how green herbs will appear in the upcoming game via the image featured below. 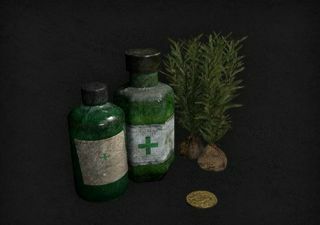 In keeping with the run-down house featured in the demo, the healing herbs and first aid ointments look a little out-of-date and worse for wear. A message reads: “Take a first look at the healing items in the game! Oh wait...what’s this coin doing here?” which might suggest a return of in-game vendors a la Resident Evil 4. The folks over at NeoGaf seem to think this is the case, however given Capcom has kept us guessing until now, I'd say your guess is as good as mine. We do know Resident Evil 7 won’t have quick-time events when it arrives in January, which is something, but I’d guess we’re in for a few more twists and turns before then.